If, a few weeks ago, you’d asked me what films about contemporary events produced during WWII were like, I’d have mumbled something about a combination of ra-ra morale building and propaganda. In many cases, and for many countries, I’d have been absolutely right, but the British have always marched to a different drummer, it seems. 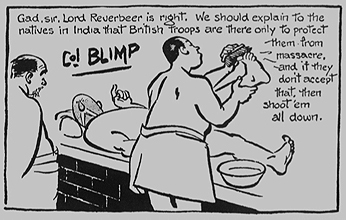 The Life and Death of Colonel Blimp (1943)is not a film that could have been filmed in Nazi Germany, and I seriously doubt that it is something that would have been permitted in the US. In fact, it was filmed in Britain despite a certain Mr. Churchill attempting to stop production and making it difficult for the producers to film. Of course, why it was not quite popular among the governors of that island is a much more interesting tale than the production itself. The first clue is in the title. 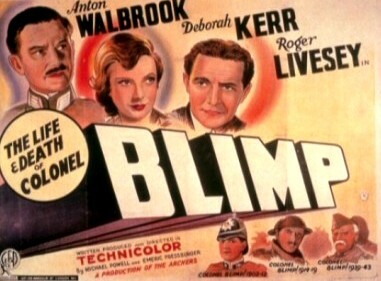 Colonel Blimp was a cartoon character from the 1930’s who made proclamations such as “Gad, Sir! Lord Bunk is right. The government is marching over the edge of an abyss, and the nation must march solidly behind them!” from various Turkish bath locales. The cartoon, clearly well-intended, and quite left-leaning (a google image search should find some more examples) was probably not the most popular of motifs by 1942. The only real link to the cartoon, though, other than the title is that the main character, in his middle age, looks quite a bit like the Colonel in the cartoons, plus the fact that the action starts in a Turkish bath could possibly make it a bit confusing to the modern viewer, but that never detracts from the entertainment value of a film which, in essence, is a bit of a romp. The second thing that was objectionable to many is that the film portrays a German (and a WWI officer at that) as a likable character. The fact that this German was not a Nazi, in fact was running from the Nazis, seemed to cause little impression amongst the naysayers. It’s not actually clear why, Specifically, Churchill was against the film, but it was rumored that he thought it was a satire of him. After production, he promptly banned it for export. 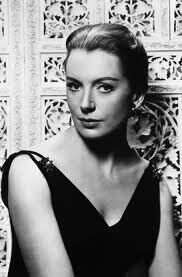 It does seem, however, that resistance was mainly from a few sectors, and audiences enjoyed it, which is unsurprising, as it follows the career of Major-General Clive Wynne-Candy, played by Roger Livesey as he falls in love with three different iterations of Deborah Kerr’s character: once as a young firebrand disobeying orders, once as a mature WWI officer looking for a wife, and once as an older man whose feelings are more paternal towards her – and of outrage towards the actions of her boyfriend in whom, eventually, he sees a reflection of his younger self. This is essentially a story of coming of age, of the wisdom of age, and the value of friendship, as shown by our German officer who becomes the good Major-General’s best and oldest friend. And, for a romp and a romance, it’s surprisingly good at showing what growing old means – and a good way of coping with the realizations one has along the way. Plus, it’s fun. We here at CE give it four Schlemmons on our newly introduced five-Schlemmon scale (invented this very to give this movie four Schlemmons on it). We will be rating all movies on the Schlemmon scale from now on, in honor of the guy who told me how Titanic ends (the ship sinks), and thereby saving me a couple of hours of maudlin lowest-common-denominator awfulness. We may use the Schlemmons for other things, too, depending on whether we feel like it. As always, updates are available via Facebook, by liking our Fan Page!